Every once in a while a movie comes along that is one part absurd, one part stupid, and two parts ridiculous. Back in 2005 that movie was Flightplan, a modest thriller starring Jodie Foster as super-anxious widow Kyle Pratt who’s travelling with her six-year-old daughter Julia (Lawston), from Berlin to New York by plane after the unexpected death of her husband (whose body is travelling with them in the hold). Hours into the flight, Kyle awakes from a nap to find that Julia has disappeared. Panicked, she accosts passengers and cabin crew alike in her efforts to find her daughter, but everyone tells Kyle the same thing: no one has seen her, not even the flight attendant, Fiona (Christensen) who saw them on board. The plot thickens when Kyle tries to enlist the aid of the captain, Marcus Rich (Bean), who is initially sympathetic, even though a check of the plane’s manifest reveals the seat Julia was sitting in is officially empty. A search of the plane is conducted, and as expected, Julia isn’t found. When Kyle insists she and the crew search the cargo hold and the avionics section, Rich finds her abrupt, pushy attitude hard to handle. He finds things even harder when he receives notification from the morgue that has shipped her husband’s body, that Julia is also dead, killed at the same time as her father. Kyle vigorously denies this to be true, but now everyone sees her as the deluded, grieving widow. With the aid of the flight’s air marshal, Carson (Sarsgaard), Rich does his best to contain the situation from getting any worse. And then it gets worse. Kyle accuses two Arab passengers (Irby, Cohen) of being complicit in Julia’s disappearance and attacks one of them. Carson intervenes but in the ensuing scuffle, she gets free. Carson chases after her but one of the Arabs intercepts her and throws her to the floor and she is knocked unconscious. When Kyle comes to she finds herself talking to a therapist (Scacchi) who nearly convinces her that her grief over her husband and daughters’ deaths have caused her to imagine that Julia is still alive (as this is easier to deal with). Kyle is almost convinced but sees evidence that Julia is alive, and she redoubles her efforts to find her. She eludes Carson and gets up into the roof of the plane where she causes the emergency oxygen masks to drop down and the loss of lighting throughout the plane. Her efforts at sabotage allow her to go below decks to the cargo hold. She opens her husband’s coffin just as Carson catches up with her. In handcuffs and with the captain diverting the plane to land in Newfoundland, Kyle doesn’t have long to find her daughter and work out why she’s been abducted in the first place. Can she find out who’s behind it all, stop them, and get her daughter back? Are you kidding? Of course she can, she’s Jodie Foster. Watching Flightplan again so long after seeing it for the first time is a strangely unrewarding experience. Memory – that elusive mistress – has covered the movie in a soft rosy blanket and if pressed, offers up a 7/10 rating, confident that it won’t be questioned too closely. But isn’t that the nature sometimes of first-time viewings, that with the passage of time some movies take on a brighter, shinier hue than was actually the case? 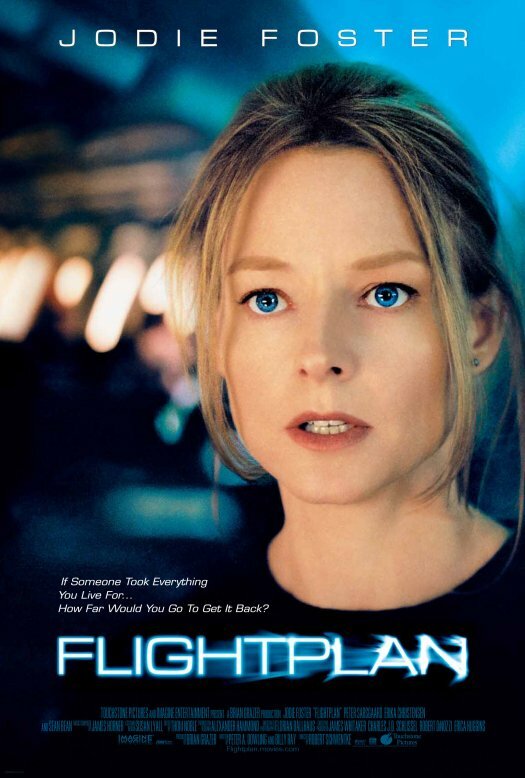 Flightplan is definitely one of those movies, its high altitude hysterics and gaping plot holes you could fly a 747 through – oh, wait, they actually did – seemingly impervious to criticism eleven years ago because the movie was a whole lot of fun. But now with the dubious benefit of a second viewing, it’s a movie that’s revealed in all its lacklustre glory (oxymoron intended). Now it’s true we don’t always expect air-tight screenplays that follow every logical line when it comes to thrillers, especially so-called “high concept” ones. 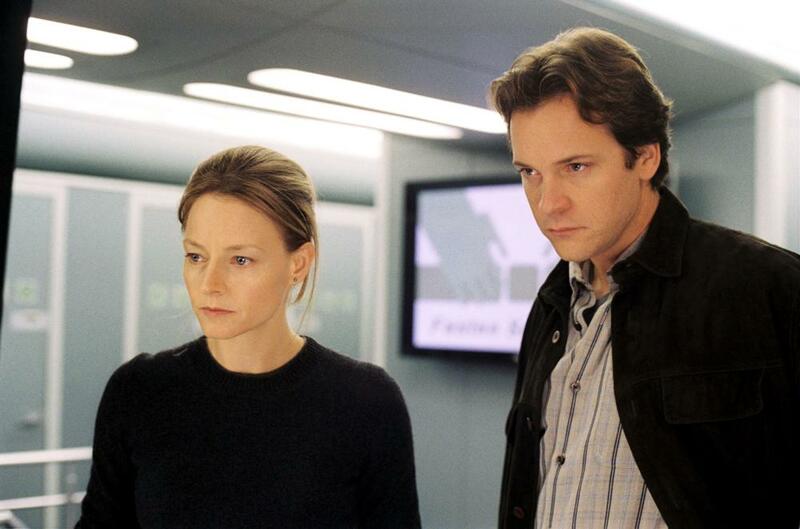 And sometimes, the ones that only come close to credibility by accident are often the thrillers we can enjoy the most, but Flightplan misses out on even this by virtue of two very grave errors made right from the start. The first is that it casts Jodie Foster as a grieving widow who may be hallucinating the existence of her daughter. Right away, the idea that Foster could be hallucinating anything, no matter how sad or grieving her character may be is patently absurd (that’s the first part, remember?). She’s Jodie Foster; she only ever plays strong women. And secondly, her daughter disappears on a plane, which in itself is a variation on the hoary old locked-room mystery, so of course she’s been abducted. Any other explanation would be just plain stupid (and that’s the second part). The movie battles against these issues valiantly, but soon resorts to running Foster around in circles in her efforts to discover her daughter’s whereabouts. All the while she looks like she’s about to have a coronary, so prominent is the vein in her forehead. But she perseveres, and is helped/hindered/helped by Sarsgaard’s dopey-looking air marshal (he really does look like he’s going to nod off right in the middle of a scene). With so few of the cast as plausible suspects for the villain role, Sarsgaard becomes the obvious choice, and despite the presence of Bean. But then he’s ruled out of the competition, then he’s back in again – oh wait, now he’s just been nice again. Yes it’s designed to add tension to a plot that lacks any kind of edge, but it only succeeds in being annoying and ridiculous (part three), though not quite as ridiculous as the reason for Julia’s abduction in the first place, which makes no sense at all and is patently ridiculous (and there we have it, part four). Still, Foster is good value, even when she’s running down aisles like a champion sprinter, or punching out stewardesses, and she’s as watchable as always, imbuing Kyle with that patented inner strength that Foster, as an actress at least, possesses in abundance. Sarsgaard limps along behind her in comparison, trying to find a way in to a character who appears to have no inner life at all and exists purely for the script’s lazy benefit. Bean gets to play exasperated at various points, but is compensated by being handed the movie’s best line: “I am responsible for the safety of every passenger on this plane – even the delusional ones!” Sadly, everyone else is forgettable, but that’s because their roles are. Schwentke directs in a bland, perfunctory style that does nothing to elevate the material (not that much could), and signals his desire early on to focus exclusively on Foster, and to the detriment of everyone else. Florian Ballhaus’s cinematography shows Berlin in the bleakest light possible before trying to make us go “Wow!” at the glamorous interior of the plane, and there’s a turgid, ineffective score from James Horner. All of which goes to prove that high concept thrillers need a whole lot more than a committed lead and a hokey script to be successful. Rating: 5/10 – Flightplan plays like a toned-down Die Hard of the skies, but with its central plot and storyline proving too uninspired for comfort, it’s left to Foster to keep things moving and the audience from straying; if you want to see an imperilled Foster trapped in a confined space, see Panic Room (2002) instead.